Featuring 52 masterful landscape paintings by Washington, D.C. based artist Andrei Kushnir, Oh, Shenandoah: Landscapes of Diversity explores the extraordinary beauty of the Shenandoah Valley region and the diverse history of its settlement. There are few spots on earth prettier than that of Harpers Ferry, the historic village located at the confluence of the Shenandoah and Potomac Rivers. Even Thomas Jefferson was impressed, noting it was “perhaps one of the most stupendous scenes in nature” after a visit there with his daughter in 1783. Though the town itself is in West Virginia, much of it is located within a national historical park that spills over into Virginia and Maryland. In his painting, Kushnir takes his viewpoint from the more northerly Maryland angle, catching sight of the face of St. Peter’s Catholic Church. The visitor, though, will likely first walk the quiet lower streets of Harpers Ferry -- a stroll through time, where there is an abandoned feeling due to frequent flooding. Steep lanes weave up and around to shops in historic buildings, and a path leading even more steeply upward is the way to the church. Originally built in 1833, St. Peter’s commands a sweeping vista of the rivers and the adjacent lush Shenandoah Valley fields. Next to the church runs the Appalachian Trail which passes directly through the town and is considered by many to be the psychological midpoint of the hike -- though speaking strictly geographically, the physical midpoint is a bit further north in Pennsylvania. 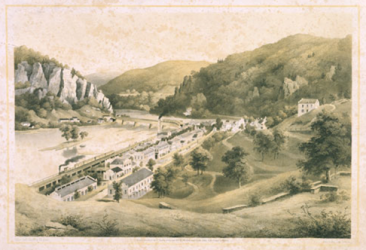 The town of Harpers Ferry was a flashpoint for political unrest even prior to the Civil War (most apparent in abolitionist John Brown’s raid on the local armory), and during the war, the town changed hands eight times between 1861 and 1865. In the 20th century, Harpers Ferry became prominent in the Civil Rights Movement. Steeped in history and awash in beauty at any time of the year, it’s no wonder that Kushnir chose to capture Harpers Ferry in his series of Shenandoah paintings. 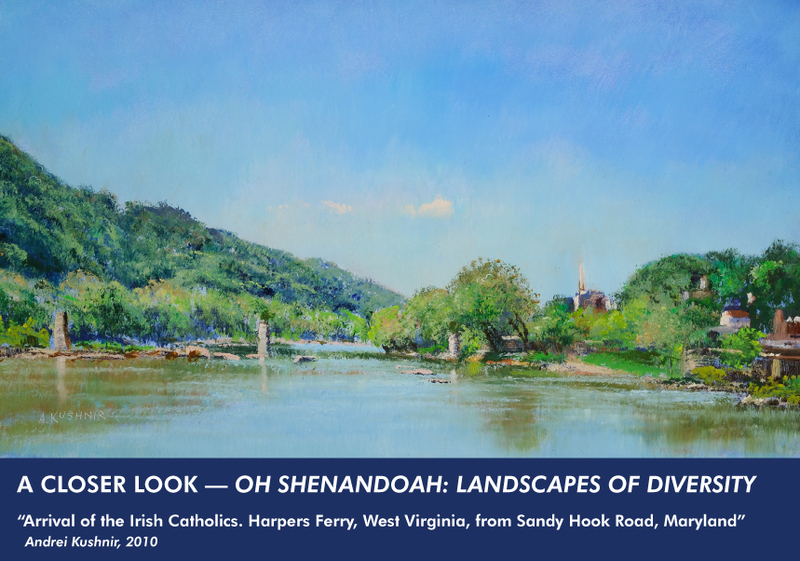 Explore the Oh, Shenandoah: Landscapes of Diversity exhibition and plan your visit. Purchase the exhibition catalog from our museum shop. 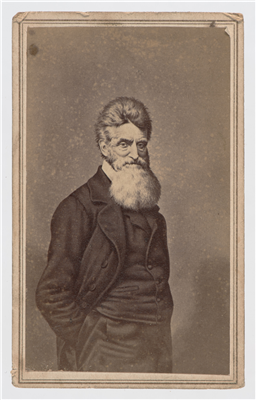 Learn more about Harpers Ferry and John Brown’s raid in this Virginia History Explorer article and banner lecture by Oh, Shenandoah exhibition curator William Rasmussen.